With a 140-character limit, it’s easy to think of Twitter as a basic platform. But the fact of the matter is numerous marketers see success in their social media marketing strategies by paying closer attention to Twitter data. 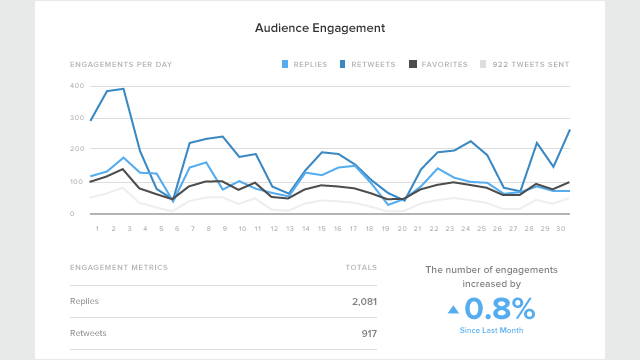 Whether it’s Tweets, impressions, engagements or clicks, there are several metrics that give you additional insights into how well you’re resonating with your audience. A common problem for companies is they don’t know the best route to take when analyzing Twitter data. This means brands have no idea why a piece of content did extremely well or fell flat. Looking into the data not only shows you what was working, but it gives you more insights to be successful on your next campaign. For example, in 2013 DiGiorno Pizza live-Tweeted a highly-anticipated Sound of Music live television event with odd and somewhat-related Tweets. The company generated more than 44 million Twitter impressions and 4,000 new followers in the week of the event. Understanding how to analyze Twitter data thoroughly helps keep your brand out of the dark. Collecting data allows you to see how a campaign performed and the trends to follow in the future. Twitter data is the information collected by either the user, the access point, what’s in the post and how users view or use your post. While this might sound somewhat vague, it’s largely due to the massive amount of data that can be collected from a single Tweet. 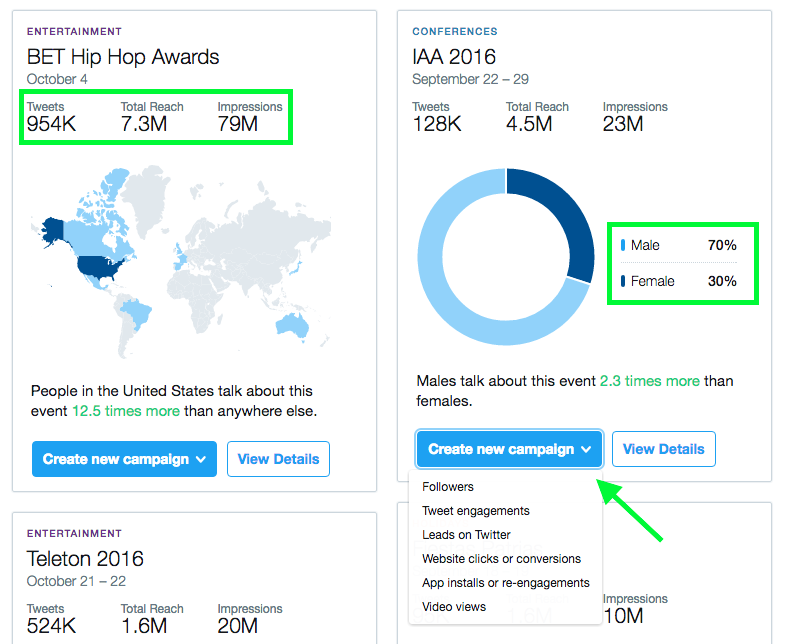 With this information, you can know demographics, total clicks on your profile or how many people saw your Tweet. This is just the tip of the iceberg, but understanding the data allows you to know how it’s used and the patterns of your content. Twitter’s built-in analytics tool gives you access to additional data beyond shares, likes and Retweets. Over the past few years, Twitter continues to improve its analytic features for advertisers, marketers and the general public. This makes it easier for businesses working on a tight social media budget, but need the data for upcoming campaigns. According to eMarketer, roughly 66% of businesses use Twitter for marketing efforts. The agency shows this number is only expected to grow over the next few years, which means Twitter will continue to put emphasis on analytics. Tweets: Total number of Tweets you sent. Tweet impressions: Total number of times a user was served your Tweet in their timeline or search results (including whether it was seen or not). Profile visits: Total number of times your profile was clicked on from your Tweets or through search. Mentions: Total number of times your Twitter handle has been used in other users’ Tweets. Followers: Total number of followers, plus how many new followers you’ve gained since the previous period. These metrics do a great job at showing traffic, views and trends. 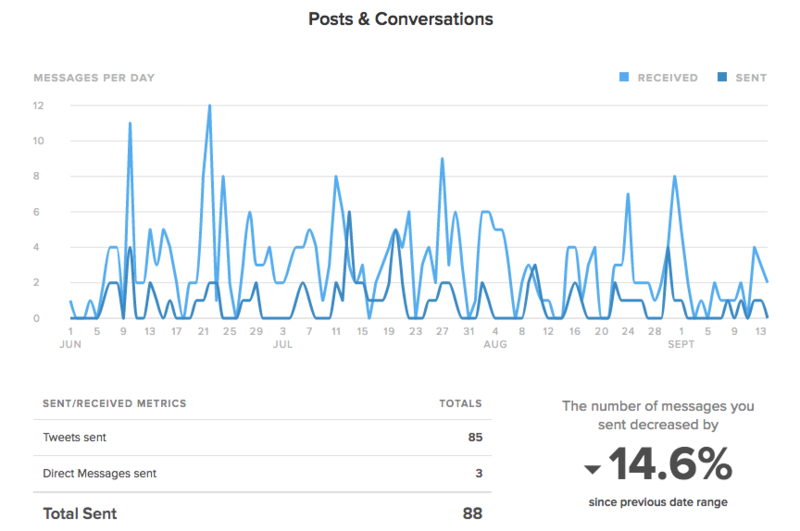 Straight from your Twitter Analytics dashboard, you can see month-to-month trends with the collected Twitter data. Tweet activity gives you a broad view of the number of Tweets and organic impressions (not including promoted impressions) for a specific day or time period. Through the Tweets section, you can also export the data from your Twitter profile to a CSV file and choose your specific timeframe. Your Twitter data changes depending on your audience type. 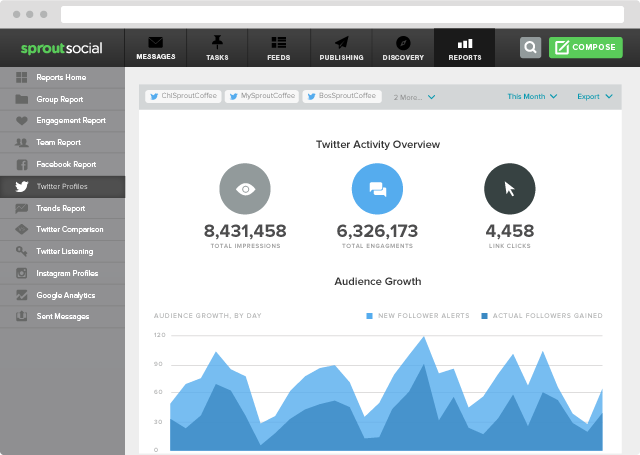 Twitter Analytics allows you to view audience insights for all Twitter users, your followers and your organic audience. Additionally, you can add a comparison audience for competitor analysis. Top Interest: The subject most likely to be in common with your audience. Top Language: The top language among your audience. Top Interest Type: The most common lifestyle category for your audience. Mobile Footprint: The top used wireless carrier for your audience. 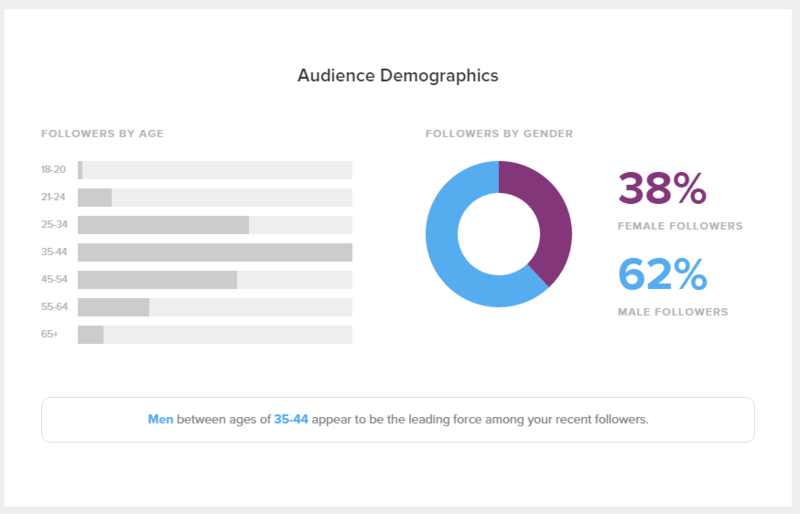 The audience insights section also details the gender of your Twitter followers and the percentage of your audience to each interest. This percentage gives you a much more in-depth look at what interests your audience might have on Twitter. Use this information to your advantage and know what type of content resonates the best with your audience. Remember to take caution when you Tweet about industry-events unrelated to your audience or brand. While DiGiorno Tweets randomly and sees payoffs, your brand might not have the same success. Use the information here to get a better idea of what’s happening in the world of Twitter and easily create campaigns around specific events. Twitter Cards: This section allows you to see URL clicks, install attempts and Retweets from your Twitter Cards. You can also select specific date ranges to see changes over time, card types, links, influencers, Tweets and sources revolving around your Twitter Cards. Videos (beta): Whether it’s promoted or standard video, you can see views, completion rates, total minutes viewed and retention percentages for your videos. This is absolutely critical to measuring your social media video process. App manager: Twitter allows you to add different apps to the platform to help you get more targeted users and to optimize content. Conversion tracking: Here you can connect your website tag to Twitter to track audiences based on website behavior. Additionally, you can use this section to measure relevant and important events on your site so you know how your campaigns, updates or site changes affect Twitter traffic. Even though Twitter stepped up its analytics game, Sprout Social lets marketers go above and beyond. Through our powerful Twitter analytics tools, social businesses gain deep insights into keyword, demographic and hashtags analytics. One of our most robust tools included in our suite is the Twitter Profiles Report. This presentation-ready Twitter report goes the extra mile with tackling Twitter data from one or multiple profiles. This section breaks down your follower growth through a selected time frame. Measuring your audience can help you plan new content strategies to reach out to more people. Look for similarities in content published and audience peaks this report to better plan your posts. Total Followers: Total amount of Twitter followers on the last day of your report period. New Follower Alerts: Gross total number of new Twitter followers within your report period. This is based on new follower alerts received, but doesn’t subtract the amount of users who unfollowed you. Actual Followers Gained: Net number of Twitter followers gained within your report period. People that You Followed: Number of Twitter accounts you followed within the report period. Follower insight: Percentage increase or decrease of your total number of followers since the end of the previous date range. Do you know how well your content is performing? Are users engaging with your Tweets? Have new users responded to your content? These are all important questions you should ask yourself about your Twitter data. 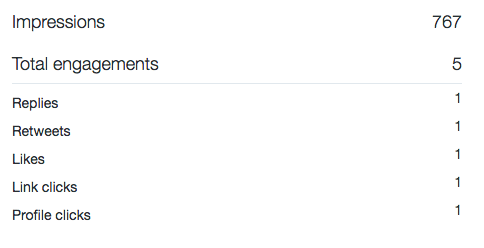 In the Posts and Conversations section, you see your sent and received metrics for Tweets and direct messages. There you track metrics such as how many Tweets you sent within a certain period or how many DMs were sent to you as well. For businesses with massive engagement opportunities, these core metrics show you how well your engagement and posting efforts are doing. Approximately every second, 6,000 Tweets are sent out on Twitter. This equals roughly 500 million Tweets per day. 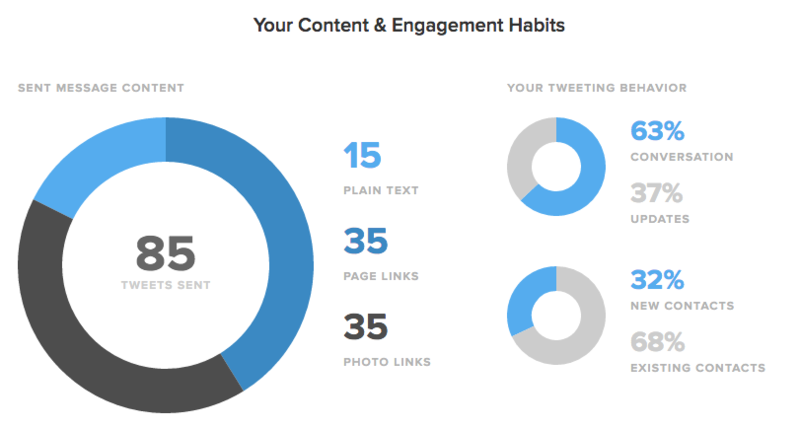 The Content and Engagement Habits breaks out the recipients of your Tweets and their content into categories. Sent Message Content: Total amount of Tweets that contain photos, external bit.ly links or neither (plain text). This is taken out of your total number of Tweets sent. Conversation vs. Updates: Total amount of Tweets sent as @replies to Twitter users within a conversation and the outbound Tweets sent to your entire audience. New Contacts vs. Existing: Total amount of @replies sent to Twitter users that you have not previously contacted (these constitute as new contacts) and @replies sent to Twitter users you have previously engaged with (existing). 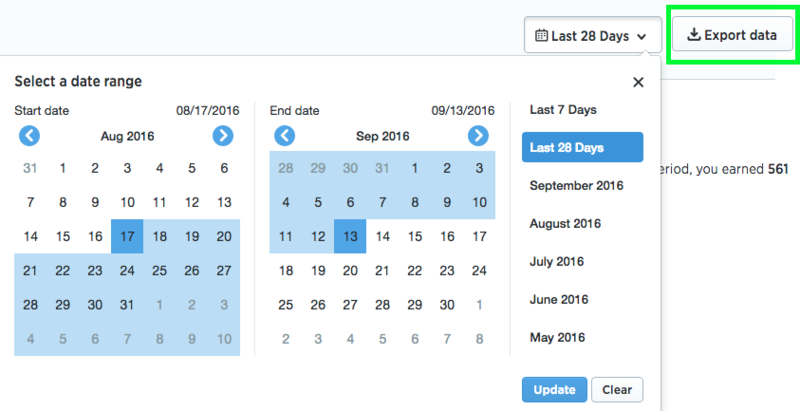 With custom date ranges, you can get more information on your audience engagement Twitter data. This will help your brand know what specific time periods drove the most engagement and reach with your audience. 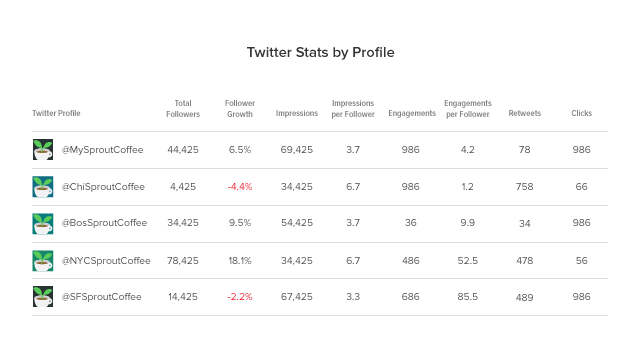 Instead of switching between different Twitter profiles and analytics tabs, Sprout provides your audience demographics all within the same report. Make sure you know what audience you’re effectively reaching to better promote and market your content. If you have multiple Twitter accounts for your brand, it’s nice to see how each profile stacks up against one another with basic Twitter metrics. With Sprout’s Twitter Stats by Profile, you get a simplistic top-level view of your Twitter data per profile such as: total followers, follower increase percentage, Tweets sent and total impressions. Now that you have a better idea of the type of Twitter data you can pull from the native platform and through third-party tools like Sprout Social, it’s time to put the numbers to use. With Sprout Social, these statistics are just the beginning of Twitter data you can pull for your profile. Other reports such as Twitter Listening, Twitter Comparison and the Trends Report all detail your Twitter efforts even further. Social media data can showcase several things for your business. Whether you want to see what content performs best or who your core buyers are, data can decipher your overall Twitter production. Marketing executives don’t want to waste money on something that is hard to prove profitable. Collecting, measuring and analyzing the right Twitter data can back up your social media marketing efforts with in-depth analytics. Sprout Social provides presentation-ready reports at your fingertips to show your team or higher-ups just how well your Twitter marketing is paying off. 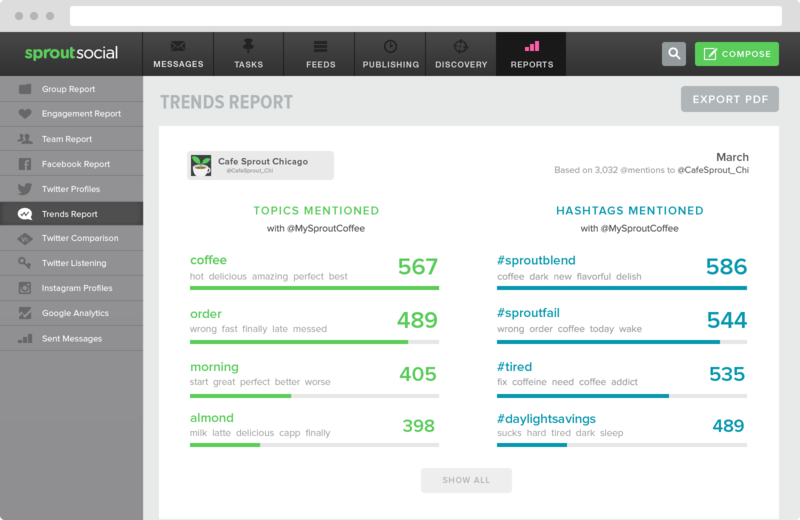 Want to see what Sprout Social can do for your business on Twitter? Try our powerful Twitter analytics tools for free with a 30-day trial!